This Ultimate Caesar Cocktail is a total Canadian classic. It’s caesar mix based with a hit of vodka. The whole thing gets flavour and spice from ingredients like horseradish, Worcestershire sauce and hot sauce. Like most cocktails, it’s made quickly (in under 5 minutes). My favourite part? It has a snack built right in! Hey everyone! This is an update on a post I did waaaaay back when. Being one of my favourite cocktails, I thought it needed a little remodel with pics and write up so….ta da! 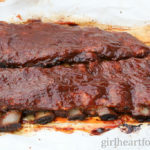 Here on Girl Heart Food, every so often, I’ve decided to have a ‘quickie Thursday’ where I will bring you guys super easy and quick recipes that can be prepared in no time. With that, let’s check out this delicious caesar cocktail recipe. Dare I say, the best caesar cocktail that I’ve tried (and perhaps you too 😉 )? What is a Caesar Cocktail? The caesar is a classic Canadian cocktail invented by a restaurateur in 1969. The rest is history because this is one popular cocktail around here! You can even find pre-mixed caesars where you would find wine, beer and the like. Truthfully, though, it’s much better to make ’em yourself because they come together so darn quickly and you can adjust to how YOU like it. Caesars can be enjoyed at cocktail hour or weekend brunch, alike. 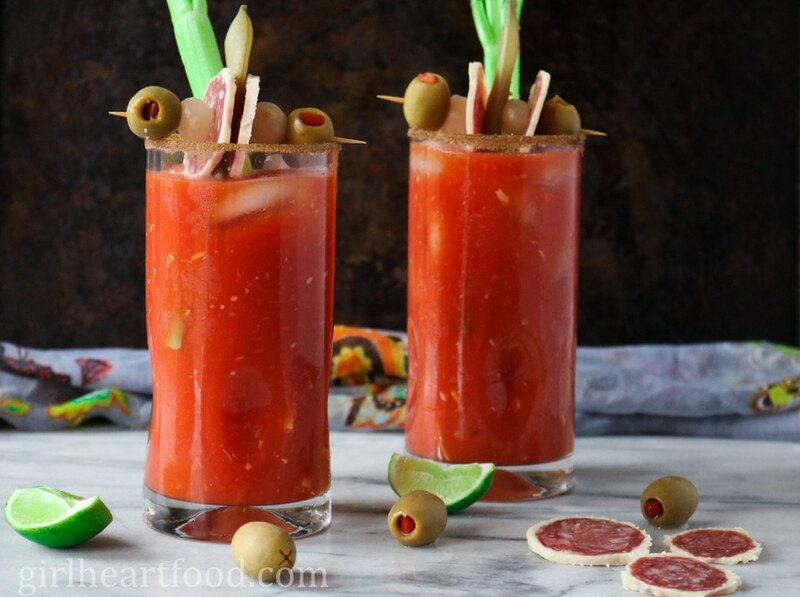 Caesar vs Bloody Mary – what’s the main difference anyway? And What is Caesar Mix? The main base of a Caesar is caesar mix (tomato juice and claim juice mixture). A popular store bought brand that’s used is ‘Clamato’. A bloody mary, on the other hand, is tomato juice based. Caesar mix (basically a mixture of tomato juice & clam broth, as mentioned above). You can easily purchase pre-mixed caesar mix in your grocery. I add a couple of additions in my caesar cocktail to give it a little somethin’ – horseradish and black pepper. Plus, I garnish with more than just celery. Who doesn’t enjoy a little snack on top?! Rub lime wedge around a tall glass to wet. Invert glass into celery salt (place celery salt on a plate). Pour in clamato juice, vodka, horseradish, Worcestershire, hot sauce, lime juice and black pepper. Stir. Garnish to your heart’s content. I’ve even seen caesars with sliders and wings as a garnish! Crazy, huh? Can I Make This a Non Alcoholic Caesar Cocktail? Of course! Vodka is a pretty neutral tasting spirit. If you prefer, you can omit the vodka altogether and have a virgin caesar cocktail. It’s really yummy, even without the vodka! Trust me, I speak from experience. Honestly, I love the snack served on top of the caesar just as much as the actual drink; both components are pretty awesome! I love mine extra spicy ’cause that’s how I roll, but you can adjust the hot sauce to your taste if you like it a little milder – I’m not gonna judge! Not a fan of caesar mix? Make this caesar cocktail with vegetable juice. I really enjoy ‘Garden Cocktail’ (the low sodium variety). Not sponsored, I just enjoy the product. Use as much or as little hot sauce as you like. I really prefer Tabasco brand hot sauce because it has a little vinegary bite (again, not sponsored, I just enjoy). Planning a party? Make a big jug of this caesar and guests can serve themselves. Only add ice when serving so it doesn’t water down. Speaking of party, how about a little garnish station? Put out little dishes of cured meats, pickled veg and the like so guests can customize their own garnish. 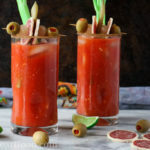 Hope you enjoy this ultimate caesar cocktail on Thirsty Thursday, brunch with friends or family or just a random Friday evening spent with your sweetie! This Ultimate Caesar Cocktail is a total Canadian classic. It's caesar mix based with a hit of vodka. The whole thing gets flavour and spice from ingredients like horseradish, Worcestershire sauce and hot sauce. Like most cocktails, it's made quickly (in under 5 minutes). My favourite part? It has a snack built right in! Place celery salt on a small plate. Wet tall glass rim with lime wedge and dip into celery salt to coat. To glass add Clamato juice (or your favourite veg juice), vodka, horseradish, Worcestershire sauce, tabasco sauce, lime juice and pepper. Use a spoon and stir to combine. Top with ice cubes. On wooden skewer, garnish as desired (I like pickled beans, salami, sweet onion and olives). Place over top of glass and add celery stick. Enjoy! Mmmm I would order that drink only for the little goodies on the skewers LOL. I’m very intrigued by the clamato juice, guess I’ll have to try, cheeeeerzzz! Haha – so tasty! I always go for that skewer of goodies first 😉 Thanks Patty! I’ve never heard of this drink before, sounds so delicious! Clamato juice? Now that sounds interesting. Love how you garnished the glasses with that little tapas! what a delight to make. My brothers would love this to start off a nice dinner on Sunday! Well, now you need to try 😉 I love mine extra spicy, but I especially love the snack with it! I totally hear you on the tastes changing thing, Dawn! I used to hate veggie juice, too, but now I love it. In fact, I’ll sometimes get bloody mary mix on a plane (no alcohol…just the mix) and sip on it. Yum! So Caesars. My curling buddies LOVE these, and they often mix up a big batch and then bring a glass out on the ice with them when we play morning games. I’m more on the tomato juice side of things, but I can appreciate a good recipe…and this is a great one! 🙂 Hope you had an awesome weekend, my friend! Figures that your curling buddies would love caesars 😉 It’s totally awesome with tomato juice too! Thanks David! Looking forward to your Quickie Thursday posts, Dawn. Hope you’re having an awesome weekend! The snack on top is the BEST – always about the food, right 😀 ? Thanks so much, Tracy! I used to hate mushrooms but now I love them. Maybe I should also retry veggie juice! Hitting the pin for sure, as this is sure to make my belly happy. I am not sure those snacks will make it into this cocktail as it all looks so delicious and I can’t control myself these days. Love this Canadian classic. Hail Caesar! Looks rather tasty and a built in appetizer, too? Cheers! Thanks Kevin! Can’t beat a drink and snack in one, can ya 😉 ? Thank you Denise 🙂 Appreciate the kind words! Ohhh, I LOVE the idea of quickie Thursday, Dawn!! When I saw this on IG, I was all like, ummm how did I miss this?!! Quickie Thursday explains it all! 😉 It is true tastes change! Our taste buds are always developing, you can just ask brussels sprouts to verify this for you. Lol, Lord knows I hated them growing up and can’t live without them now! I’m a huge fan of brunch cocktails and this is one of my favorites!! I’m totally digging your snack skewers built in to this libation! Definitely making this on Sunday! Cheers, doll! I love caesars so much but I think it’s the horseradish. I like enough that it starts to resemble cocktail sauce! As an expat from Canada, I do miss my weekly Bloody Caesar! Don’t know if you know you guys but Clamato is quite a difficult one to find in Europe:( I like your version with horseradish! Give it an extra kick! Oh, that’s too bad! I love that spice from the horseradish – so good! Thanks so much Marie! I always love a good Caesar! And a homemade one is so much better than those pre-mixed Caesars in cans. Great recipe! I didn’t use to like ceasars but have grown to love ’em. 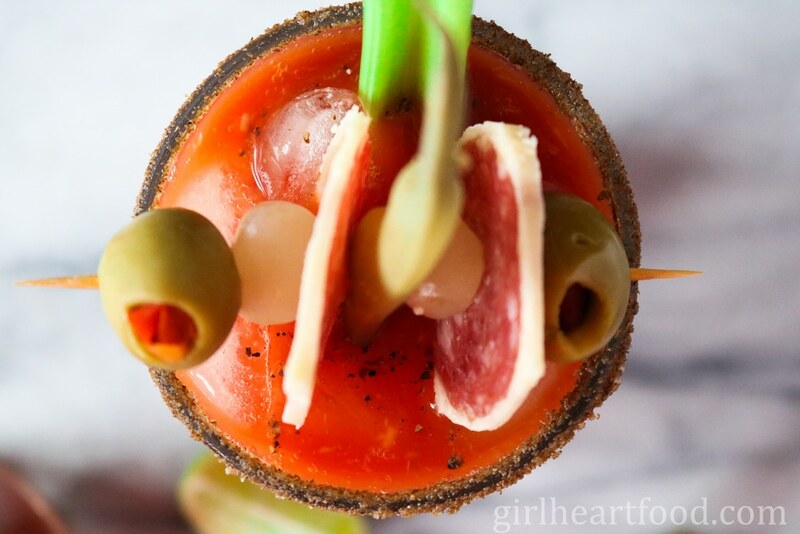 Love your garnishes! I once had a version where there was a huge chunk of lobster meat on top. How can you not love that right? It’s such a fun drink. Hooray for Friday, we made it 🙂 This drink would be perfect. Have a wonderful weekend! The weekend is almost here and I am ready! I think I need one of these cocktails. I love bloody marys so I’m betting this would be fabulous too! Have a stupendous weekend! You totally do 😉 You’d love this one, Kathy! Have an awesome weekend too! 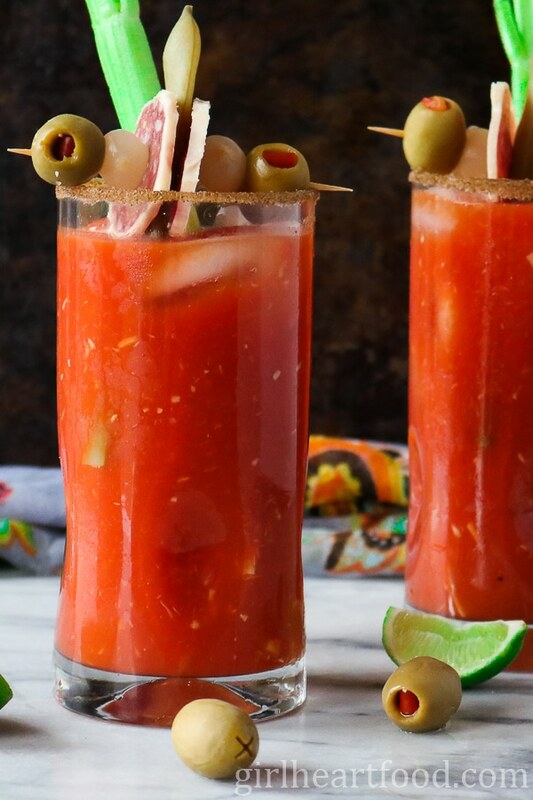 Bloody Mary’s are my jam so this Ultimate Caesar cocktail is right up my alley. I like the idea of Quicky Thursday I never have a lot of time so this is perfect for me. It took me awhile to warm up to vegetable based juices also Dawn, so happy to know that I’m not alone. All the toppings look beautiful and tasty. I don’t know much about cocktails, but I know how much a good Caesar or a Bloody Mary are appreciated, especially here in Canada! I’d love to try it! It looks beautiful and love all the garnishing. It’s perfect for aperitivo time in Italy! Definitely 😉 Thank you Nicoletta!! So this might sound crazy but I used to detest white chocolate. Fortunately I got over that :). My favorite part of any cocktail is the garnish–what can I say, I like to eat! I love all the garnishes you have going on here. This whole drink just looks beyond epic. PINNED! Have a great weekend Dawn! Yum! My kind of cocktail:) With the Clamato it reminds me of a Michelada a bit. Love the garnish! We used to live next to a small ski area called Arrowhead. Not that great snow wise, but they had Bloody Mary’s with salad like garnish:) and a huge outdoor fire place at the base area, with chairs and blankets. We went a lot:) sometimes didn’t even ski. They need to learn how to make your Canadian beauty! Pinning for later! Dawn, you make my bloody mary look so simple and un-garnished, I love the pictures and love, love, love all the garnishes on top! Have a great weekend! You are a girl after my heart!!!! I love a Bloody Mary! Haven’t made a version with Clamato Juice, but I will be this weekend!!! YUUUUUMMMMM! Haha! I hear ya! Hope you love it as much as I do 😉 Thanks very much, Katie! Love this cocktail Dawn! And all of your garnishes push this one right to the top! This would be a fabulous addition to a brunch menu. So fun! Pinning and can’t wait to try! Thank you Mary Ann! Garnishes are my fave!! Appreciate the kind words and Pin, my friend 🙂 Have a lovely weekend!